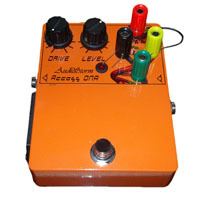 The Access DNA pedal is a totally unique kind of overdrive that allows you to change the core electronic components that generate your tone, quickly and easily. You can use the components we supply, buy your own, scavenge or strip them out of old broken vintage gear to create your own drive that is the one and only, absolutely unique tone of its kind in the world! And no! You don't need to know anything about electronics to make this happen. You can start with one of our layouts and then just use trial and error. Every component you can find is fair game and we can't begin to predict what you are going to do. In fact, we are so excited about it that if you design something awesome we will feature it on our website and link-back to yours as a thank you for sharing! What does it sound like? Well... We just don't know! You can use our designs to start off with some DOD250(TM) or TS9(TM) type tone but, really, it's your call! IT'S ALL YOU!! FET inputs for super low noise. Low impedance output to drive any amp, desk or really long cable without loss. A selection of components to get you started including Silicon and Germanium diodes. ALL THE TONE IN THE WORLD! I love tweaking and tinkering with tone and I really wanted to open up that freedom to everyone. Even if you are great with a soldering iron it's time consuming and a faff and nothing ever quite sounds how you expect. Or else it just ends up sounding samey. The ADNA is not just a creative tool but a gateway to a world of tone. It's really easy to just twist in diodes or capacitors on the fly and do something creative and I am really hoping some of you will get into this and surprise me with it!